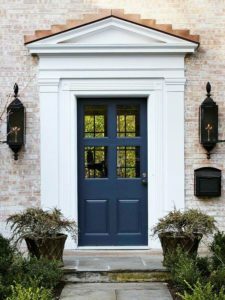 Trim Color for Your Brick House | Batchelder & Collins, Inc. Written by terri on April 12, 2019 . Posted in Featured. We get questions all the time about this subject because it’s one of the most challenging colors to choose when it comes to home improvement. That’s why today we’ve decided to talk about choosing a trim color for your brick house. 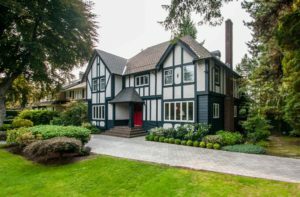 There is no right or wrong way to do this, but when it comes to making a home improvement decision that can have such a large effect on your home’s curb appeal, we find that any advice is helpful. We all know brick comes in all kinds of shapes and colors, not just your traditional red so there really isn’t a one-color-fits-all response to this decision. And even if there was, would we really want the same cookie-cutter exterior as everyone else in our neighborhoods? No. Oftentimes, when homeowners choose a trim color for their brick house, they will select just one color and paint everything that is not brick. But consider the elements of your home that look best disguised, your gutters and faux shutters for example. You’ll want to paint them a color that blends into the brick so you should gather paint chips that match the dominant hue in the brick. Here’s a helpful tip: With paint chips in hand, stand back from your house, far enough away that the bricks all seem to merge into one color. Hold up the paint chips and pick the one that most closely matches. We just talked about concealing the less appealing elements of your home but what about the lines of the house? You should decide whether you want to highlight or conceal these. If you feel like the exterior of your home is unappealing or plain, you may choose to conceal it by painting the trim with the same color that you painted the gutters. If you find the shape of your house to be something you want to highlight, emphasize the roof line, overhangs, and windows with deep or contrasting color. Either way you decide, you should pick one or two areas that you want to paint with a bold accent color. Many choose the front door but you can also choose the shutters or another architectural part that makes your home distinct. Tip #2: Blend or Contrast? On a similar note, you’ll have to decide if you want your color as a whole to blend in or contrast the color of your bricks. In this process, you can eliminate undertones that you know you don’t want. For example, if your brick home is red and tinged with brown, the warm undertones might contrast too sharply with a cool stark white trim. If you want a color that blends, you can take a brick to the paint store and they can match the color almost exactly. If you want to contrast the brick, choose the lightest or darkest shade in the brick. This also applies to multi-color bricks where to blend, you’d choose a medium shade and to contrast, you’d go with the lightest or darkest. Before choosing accent colors for the wood trim of your brick house, consider the color of the roof. 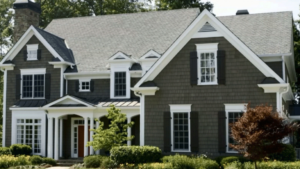 The color of your roof is just as important in this decision as the color of the brick. Yes, a brief tip but an important one. While you may have a clear idea of what you want for your home, it can still be a good idea to look for color ideas outside of the paint store. Good color combinations aren’t always obvious. Drive through neighborhoods with houses that you like the look of, browse decorating magazines and Pinterest, take a cruise around your own neighborhood because even though you might not want a cookie cutter look exactly like your neighbors, you also may not want it to stand out too much. Oftentimes, houses that are too out there from those of its neighbors draw negative attention from potential buyers if you choose to sell in the future. When there’s a startling contrast between your house and the rest in your neighborhood, it can look less attractive. We are by no means saying that you should choose the same colors your neighbor has used, but just keep it in the back of your mind to avoid clashing. Typically if you want to showcase brick, white is a good option, no matter what color the brick’s natural shade. It provides a high contrast that defines the home’s architectural lines and emphasizing its facade. Off-white trim with a yellow or cream undertone has a subtler effect and is well suited for gray, black, or brown crick or homes with a more traditional design. In order to downplay and not emphasize a highly-saturated exterior color, opt for a dark trim that is in the same color family as the brick. Or you can choose a neutral black or deep gray to outline red, brown, gray, or black brick houses. Once you have a rough idea of what color/shade you think you want, pick up a sample size quart, paint two large poster boards with the color, and tape them to your front door. Walk out to the street and look at it during different times of the day; depending on where the sun is in the sky, the color can take on different hues and tones. Note what you do and don’t like and bring this feedback to the same paint store. They can help to tweak the hues/undertones or help you decide on a completely different color.